Chinese rose is one of the species of hibiscus, shrub of the family Malvaceae that are grown as houseplants for lush, brightly colored flowers. With sufficient care, hibiscus blooms can be admired from spring to autumn. China rose propagated by seeds or cuttings. For growing hibiscus from cuttings use young shoots with a length of about ten centimeters with three or four leaves. Cut them in July-August. If the escape of large leaves, cut half of the leaf plate. Thus the shaft will evaporate less water. Rooting cuttings of Chinese roses in the water or moist substrate. For rooting in water, place the escape in an opaque container with water. 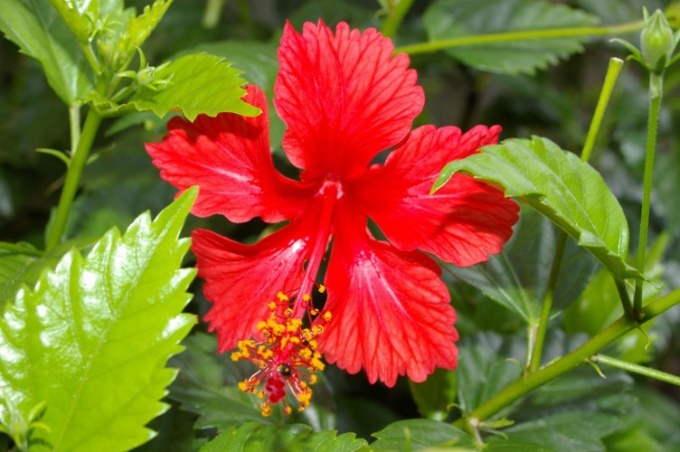 However, it is noticed that plants rooted in the water grow much less than those of the hibiscus, which were rooted in the substrate. To root the shoots in the substrate, sprinkle on the bottom of the container a layer of expanded clay. It will put the soil, consisting of equal amounts of leaf, peat soil or washed sand. Moisten the substrate and put in it the cuttings and cover them glass jars. Within a month the shoots will take root. Rooted hibiscus can be seated in pots. To do this, mix the soil from one part of sand, the same amount of humus soil, three parts of leaf soil and four parts sod land. Pots for young plants should have a diameter of not more than nine inches. Chinese rose will suit a well-lit window sill, but from the strong sunlight it should be protected. The temperature in the room where the plant should not fall below twelve degrees. To maintain the humidity of the Chinese rose should be sprayed with warm water. In the spring, transplant the plant into a pot larger in diameter and trim branches by one-third the length. Watering Chinese rose regularly, as drying of the earth. The sudden change of the mode of irrigation, lighting or humidity, the plant may lose leaves or buds. Before the age of five hibiscus transplanted each year, increasing the diameter of the pot. To transplant this plant is best in April. Older Chinese roses are transplanted every three to four years.